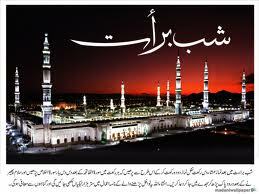 Sab-E-Barat is Coming on 1st July 2013. India is a home of many religions and cultures; every religion celebrates their specific festivals. Muslim community also contributes to Indian population. 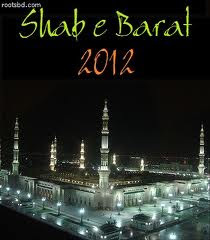 Muslims from across the world commemorate the festival of Shab-E-Barat with splendor and zest. They believe that the god writes the future of all men by accounting for all the past deeds committed by them on the night of Shab-E-Barat. Basically Shab-E-Barat means the night of forgiveness or Day of Atonement, Shias see it as the night on which their 12th and last Imam, Imam Muhammad Abul Qasim has been born. 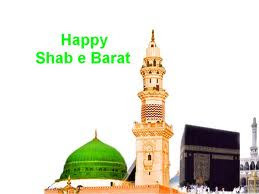 ‘Shab-E-Barat’ is a Persian word composed of two distinct words, ‘Shab’ which means night and ‘Barat’ which means ‘the night of payment or assignment’ in Persian. In Arabic the day is known as Lailatul Bara'at, meaning the night of liberation. 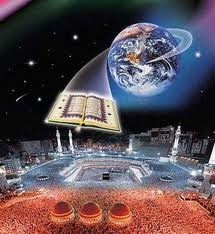 People pray to god and recite holy Quran whole night to forgive them for their evil deeds. Muslim visit graveyard early in the morning and offer flowers, read fateha for the peace of the near ones departed souls. The festival is fêted on thirteenth or fourteenth day of Sha’ban month of Islamic calendar or fifteen days before the commencement of Ramadan. The festival is also known as Boraks Nigh. Read 6 rakaat Nafl prayer (2+2+2), after Magrib. After every two rakaats read Surah Yaseen once. This special prayer, by the blessing of Allah Almighty, will give you a healthy and prosperous life for the whole year. Read this dua : "Allahumma inni al-aloka afwa wal afiyata wal muafatad-daimata fid dunya wal akhirah"
In Persian language, 'Shab' means night and 'Barat' means - the night of commission or assignment. In Arabic language, however, the day is known as Lailatul Bara'at, meaning the night of emancipation. Some though see Shab-E-Barat as the night of good fortune and a popular legend says that on this night the Prophet visits each house and relieves the pains of suffering humanity. Colourful fire works keep dazzling the skies as the Muslims stay awake on the night of Shab-E-Barat. This is due to a belief that god writes the destinies of all living beings for the coming years in heavens during the night. Sweets, specially the delicious savaiyyan or the vermicelli is prepared and sent to friends and also to the relatives in their remembrance of those who died during the year. Some also perform acts of charity by distributing goodies to the poor and needy in the name of their deceased ancestors. Flowers are also offered to the graves of the deceased family members. Fatiha or the blessings are recited over the meal in the name of the Prophet, his daughter Fatima and her husband Ali. The Holy Book of Quran is also read to mark the day. Muslims hold a belief that if someone prays to Allah throughout the night and seek forgiveness for all the sins he may have committed, he could be forgiven. Therefore, the entire night of prayer is devoted to asking for forgiveness for the past year and for good fortune in the year to come. Some people also go to mosques for prayers and meditation. While some Muslims fast during the day and render nafal, the optional namaz at night. It may be noted that there is no mention of Shab-E-Barat in the holy book of Quran. 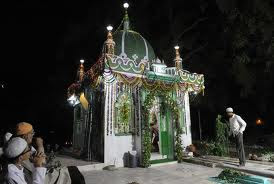 However, Sura Dukhan does mentions about Laila Mubaraka, which, according to the learned scholars of the Quran and the Hadith, is Shab-E-Barat. 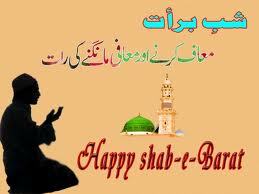 With His Countless Blessngs On Shab E Baraat. Remembr Me And My Family In Prayers! So Please Forgive Me! For That..
To Sab Se Pehle Yahan Log Krte Phir Pori Donya Me.